Krishi Vigyan Kendra, Ri-Bhoi, ICAR Research Complex for NEH Region, Umiam organise d a Field day on Seed priming in pea for improving the productivity and nutrient efficiency in acid soils at Umeit village on 19th March, 2018. 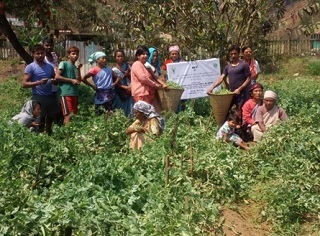 In Ri-Bhoi District, farmers get lower yield due to improper fertility management. The objective of the programme was to popularize and showcase the Seed priming (1% ZnSO4.7H2O, 1% KH2PO4) in Pea for higher productivity. 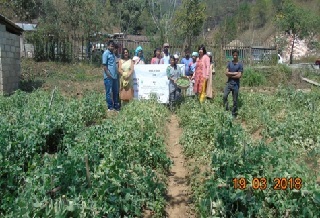 About 26 farmers, farm women attended the programme from Umeit and nearby villages. The farmers were very happy with the low cost technology by getting higher yield. Many farmers from within the village and nearby villages are expected to adopt the technology at their field next season. The farmers expected to get higher yield as compared to the traditional practices without application of any sources of nutrients.